Paul Hatrak, CPA, CGMA, Certified Business Coach, Explains How to Better Communicate for Success. Communicating For Success: Watch Your Language! Do you run your personal and professional life like a business? Do you think like an entrepreneur, regardless of your position within your company? Do you want to turn Confusion into Clarity in your business? You may be losing up to 75% of business opportunities because you do not have an entrepreneurial mindset and communicate the same way with everyone. Attend this interactive workshop and learn to become sustainable with improved focused thinking and identifying behavioral styles that will tailor your brand message to your target audience. The workshop is free to attend, and all Chamber members and prospective members including business owners, entrepreneurs, and individuals who want to start their own business are encouraged to attend, learn and network. 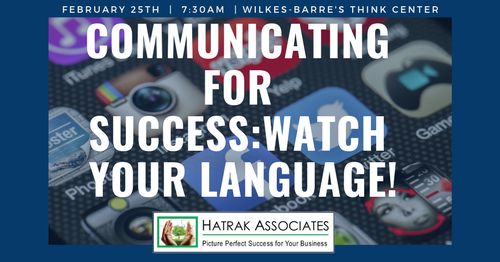 For those who cannot attend in person, this presentation will also be livestreamed from the @hatrakassociates Facebook page, beginning at 8 AM on February 25th at https://www.facebook.com/hatrakassociates/. CPA’s in attendance at Wilkes-Barre’s THINK Center will receive 1 CPE credit in Personal Development. As President of Hatrak Associates, LLC and a FocalPoint Certified Business Coach, Paul's mission is to work with entrepreneurially minded professionals who are seeking to grow themselves professionally and personally. Building on a highly successful career in the insurance and financial industries, as a business coach Paul views himself as a “Recovering Accountant” who combines understanding of detail-and-process oriented professionals with a passion for helping business people overcome obstacles and learn to communicate like confident extroverts, even when they aren’t. Paul asks all his clients, “Do you run your practice like a business?” If they don’t, he helps them restructure their approach. If they do, he works together with them to take their sales and marketing model to a higher entrepreneurial level. Paul held senior financial management positions in large and small companies, holding such titles as Regional Finance Officer and Controller. As Regional Finance Officer of Willis Group Holdings, he directed finance activities impacting the $100M New York Metro region. Paul joined Willis from Marquis & Associates Inc. where he was a Partner and Controller. He also has previous audit and tax experience with Deloitte & Touche. Paul holds a BS in Accounting from King's College and is a CPA, licensed in Pennsylvania. He is a member of the American Institute of Certified Public Accountants (AICPA), Pennsylvania Institute of Certified Public Accountants (PICPA), and served on the board of the National Speakers Association. Paul’s best-selling book titled “Picture Perfect Business Success, How to Go From Confusion To Clarity In Your Business” debuted Number 1 in 5 Amazon categories. He is also an avid networker, connector and golfer.